Of the ten-day countdown before our daughter, Shantel, moves into her own apartment started out nice and slow. Shantel didn’t have classes today so I didn’t have to make that drive to Phoenix. Instead, I decided I would get the grocery shopping done and go visit my mother. I have been eating, drinking and sleeping talk of “the move” for so long now that I just decided since Shantel would be home today watching her TV shows, I would give myself a little break from even thinking about “the move…” or so I thought! 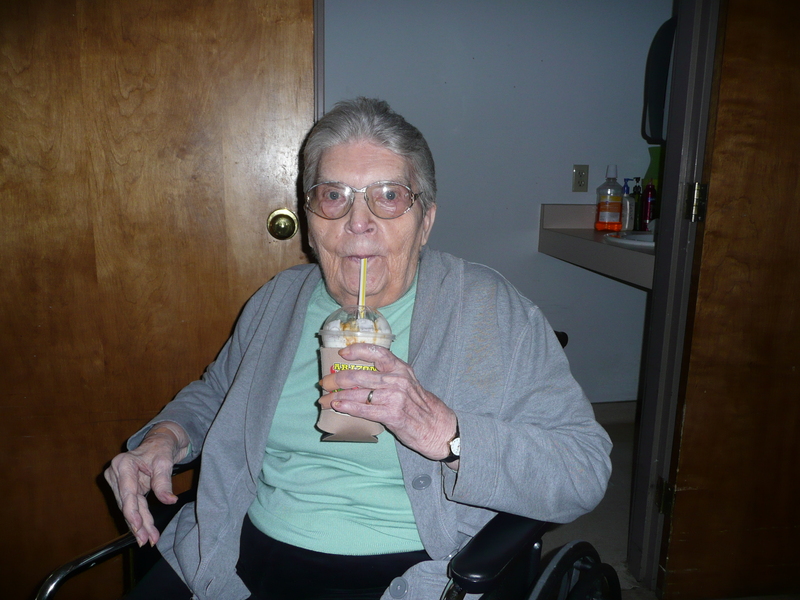 On my way to visit my mother at the Care Center, I stopped by McDonald’s to get a caramel frappe, her absolute favorite treat. Visiting with my mother is somewhat of a challenge now because she has lost the ability to follow along with conversations for any length of time. 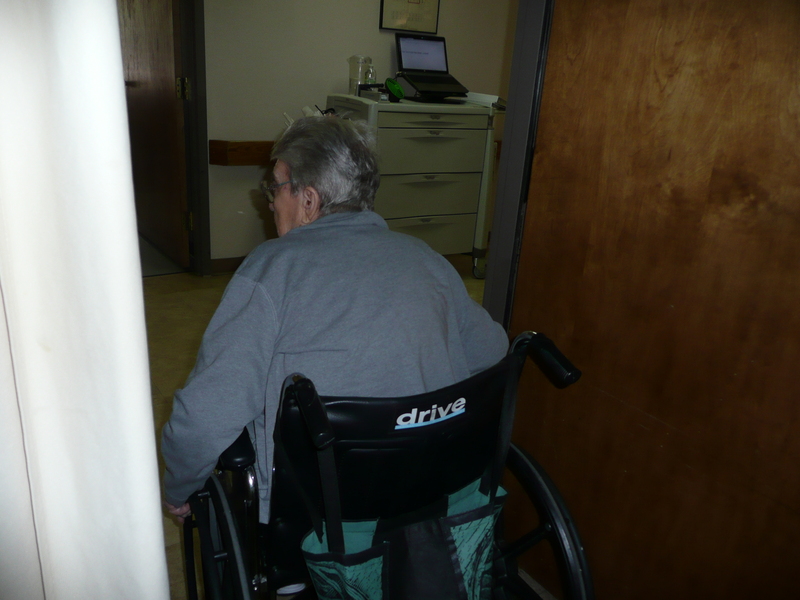 After the initial hello, and hugs, mom will tell me a few things about what she thinks is going on in the care center. However, some of the stories she tells me are really far-fetched… and when I ask the duty nurse about some of the things mom tells me, they tell me most of what mom is talking about didn’t really happen or it is only bits and pieces of an actual event. Even on the rare occasion when my mother asks me what is going with my husband, Bill or Shantel, when I start telling her she is so easily distracted she will just turn and leave mid-sentence. Today mom asked me about Shantel and what is going on with her. She remembered she is moving out and asked if she is in her new place yet. 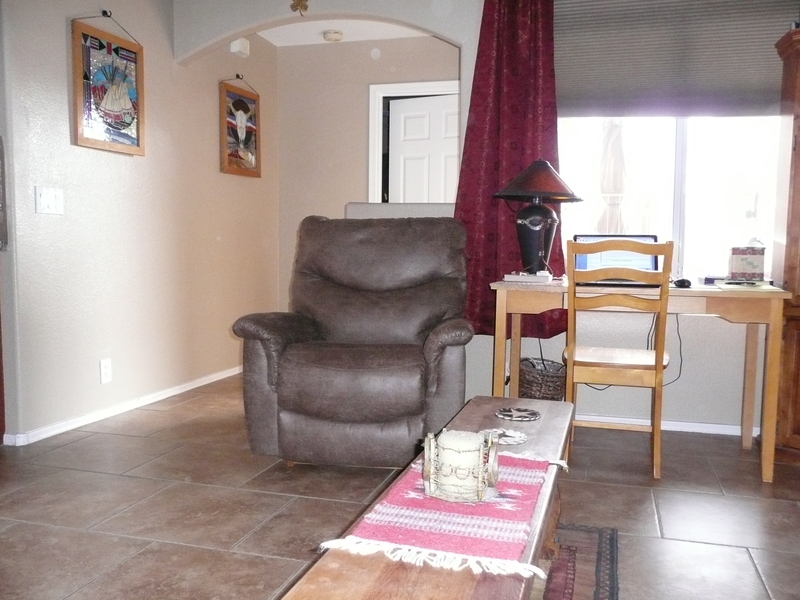 I tried to explain in simple, short-terms, about Shantel moving, but before I even got to the date of the move, mom turned and started towards the door. So, because of my mother’s lack of attention span, I spend most of the time during our visits looking for things to talk about with her. 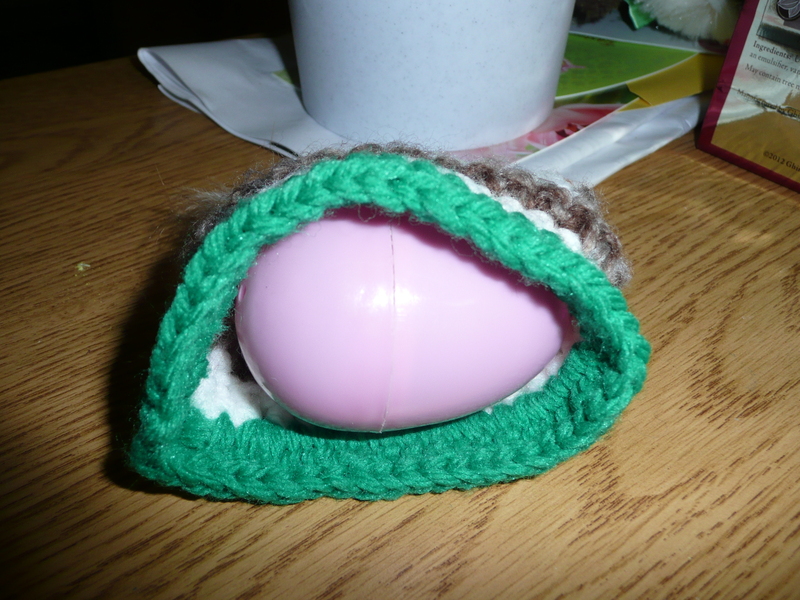 Today, I happened to notice this little handmade Easter decoration. 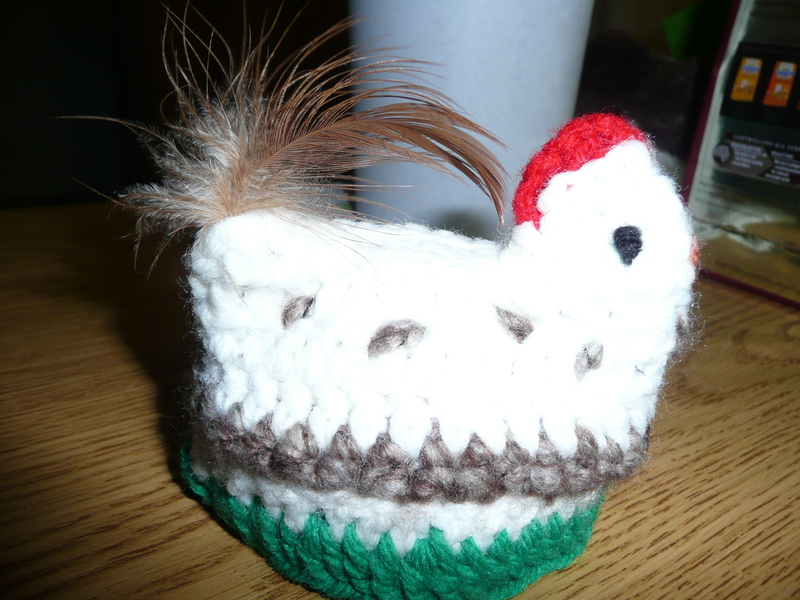 How adorable is this little chicken egg cover, complete with a real feather for its tail? 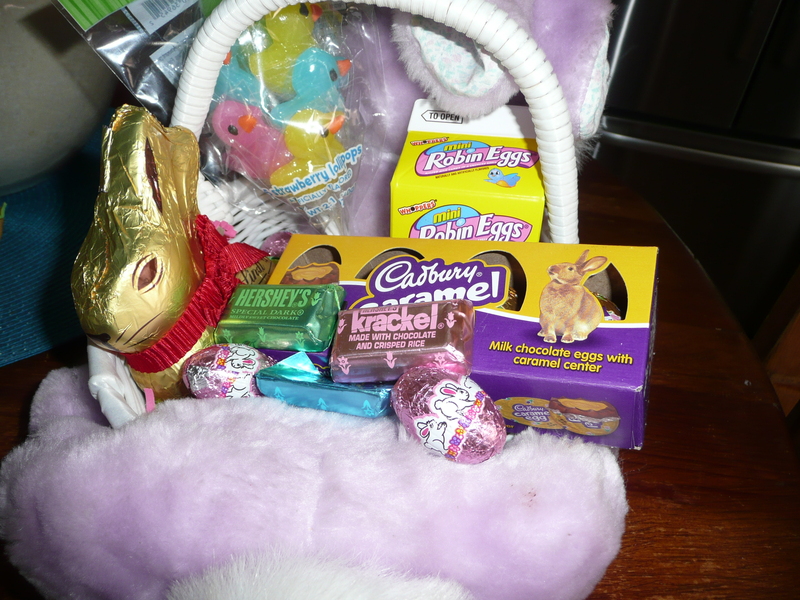 See, you flip it over and it is hiding a plastic egg filled with little candies. I LOVE that! I was able to get enough information out of mom to understand that the woman who oversee the Catholic Church Service every week, and bring Holy Communion to the residents, made these adorable little chick egg covers for all the residents. So CUTE! Before long my mother said she was tired and wanted to take a nap. I hugged her and said I would see her again soon. Today Shantel didn’t have to start her first class until 11:00 so she asked me if I would take her to get her hair cut at 9:00, then stop by Fry’s grocery store, the donut shop, and then McDonald’s for lunch all before her first class… Shantel never has just one errand to do it’s always three or more… Always! As I was driving back home, I started thinking about our family life together over the years… Then, when I arrived home, I started looking through some family photos. 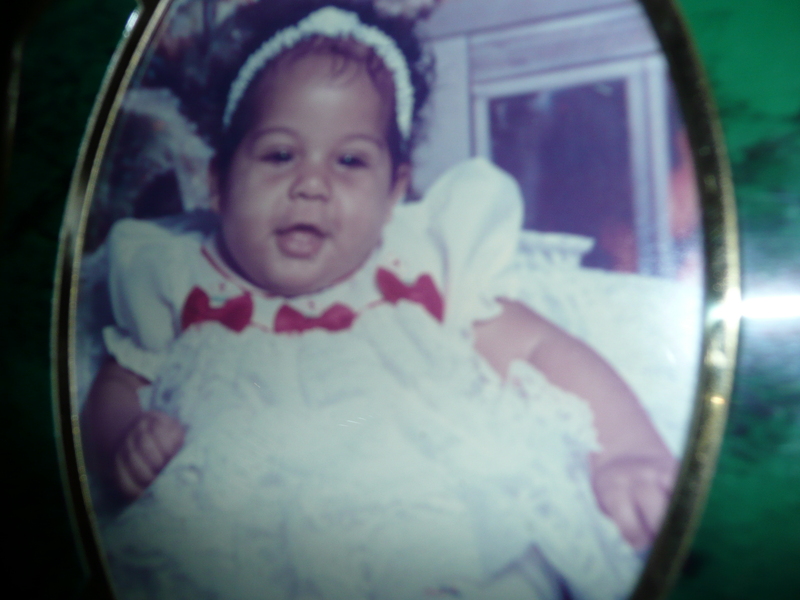 This is the very first Christmas dress I bought Shantel and had her first baby picture taken in. I LOVE this photo more than any others because those are Shantel’s natural eyes before she lost them both to cancer.. 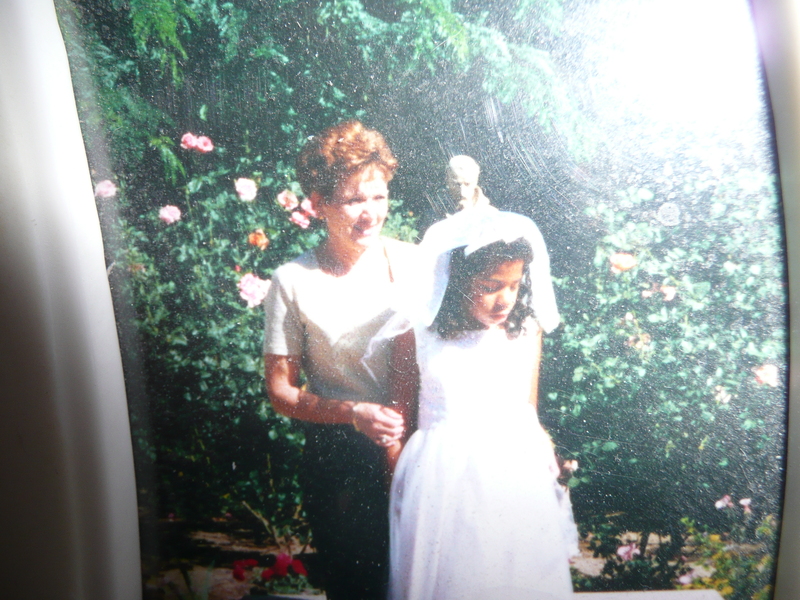 I also found this picture of her going to receive her First Holy Communion. She looked so beautiful in her dress. 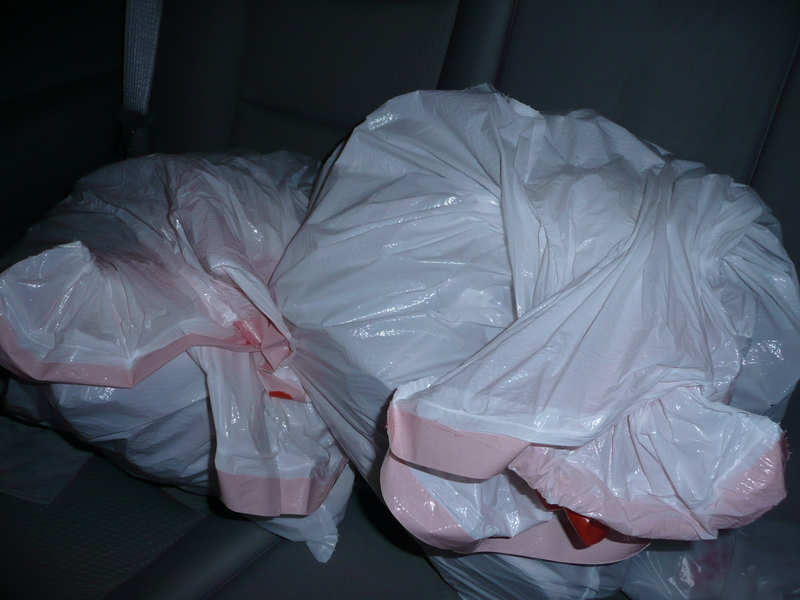 I donated that dress to the church for another child to wear who may not have otherwise be able to afford one. As time went on, Shantel became very interested in basketball. She LOVED the Phoenix Suns. She would have us print out the game schedule and listen to every game on her radio in her room. She understood every play and knew all about every player… Bill took her to several Sun’s games. At one game as they were waiting in line for autographs, one of the players, Channing Frye, actually took off his game shoes, signed them, and gave them to Shantel. 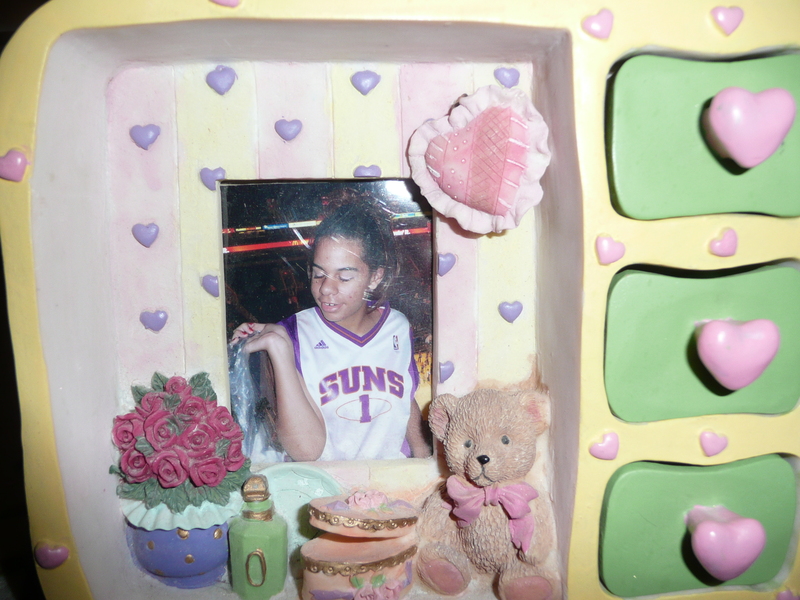 She also has a basketball signed by all the Phoenix Sun’s players…. Shantel was over the moon excited about all that! After many, many, hard battles with the school system from grade school all the way up and through High School, fighting for Shantel to have the accommodations she needed. Accommodations such as braille books and assignments from the teachers brailled, so she could read them independently and do her work without the need to have someone read handouts or books to her…, High School graduation day finally arrived. 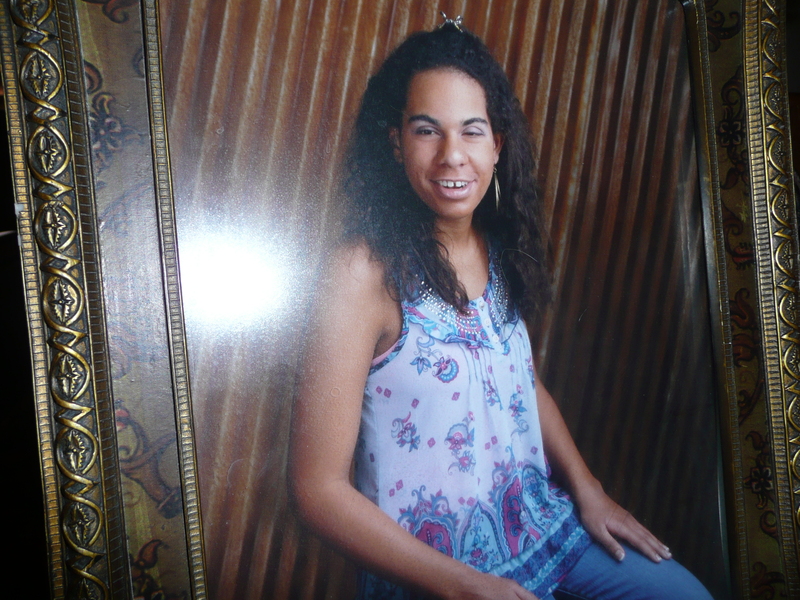 This is Shantel’s High School graduation picture. I’m not so good at taking pictures of pictures and sorry for the flash light on the picture….but you get the picture right? Our hearts were bursting with pride as Shantel walked across the stage to get her diploma. We love you so much Shantel. Papa and I know you will do well no matter what path you take in life. You are smart, and strong, and we are so very, very, proud of you. I was ahead of him in the aisle so I didn’t see the price but agreed I thought it would be something different we could have for dinner… I reminded him that Shantel most likely won’t want to try it, but Bill said that didn’t matter because she doesn’t like a lot of things we like… (she is a very picky eater and I bet when she moves into her own apartment, in two weeks, she will survive on hamburgers, fries, and chinese food unless I make something she likes and bring it over to her). Anyway, I usually sit at the tables at the front of Costco watching people while Bill goes through the check-out line. As he was walking up to me he had a strange look on his face so I asked him what was wrong? As he was looking at the receipt, he said “OMG, I didn’t know that salmon cost that much!” I said “how much did it cost?” He showed me the receipt and I almost passed out when I saw it cost a whopping $30.02!!! I said “wow Bill, that is a lot of money for a piece of salmon…” That is when he said I thought the sign said the salmon was $14.99. Obviously he misread the sign or looked at the wrong sign altogether! I said “well why don’t you take it back while we are still here and tell them you misread the sign?” He said “no, it will be OK, we will try it.” Then he laughed and said “But I hope it isn’t too good.” I said “yeah, because we don’t want to fall in love with something we can’t afford to keep buying, especially now that we will be trying to help Shantel too…” Ha! Funny boy… his birthday is in December! I went to visit my mother at the care center today. I arrived just as she was getting ready to go to lunch. I pushed her into the dinning room where a “new” resident was sitting at the table my mother and her tablemate Joan claim to be “their table.” What an issue ensued as a result of that. Immediately my mother wanted to know who she was and who told her she could sit at “her” table. The new lady said her name as Mary and she was lost. She said she needed to find her brother-in-law who must be walking up and down the halls looking for her. One of the dinning room workers came over and asked Mary is she would like some potato soup. She said “no, I just need to know where I am and where my brother-in-law went. She said she needed to go to a phone and call all the 800 numbers so she could find him. About that time my mother’s tablemate Joan arrived and wanted to know who this new woman was and who told her she could sit at “her” table… Mary said she didn’t know who brought her here but she just wanted to find her brother-in-law. 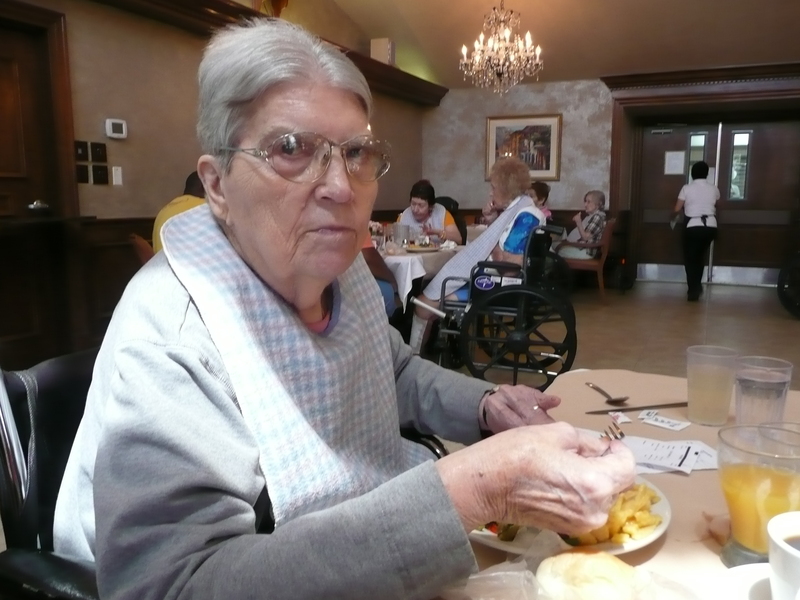 After Mary was removed from the dinning room, Joan proceeded to tell me that the center is having a delayed Easter dinner today for lunch because apparently someone forgot to order the ham that was supposed to be served on Easter Sunday. I said “so you are all going to celebrate Easter together right now? Joan and my mother said “yes” we are celebrating Easter today and after lunch we are having a church service and a choir come to sing Easter songs to us. I just shook my head and thought to my self… “you might want to use that time to go repent for how both of you just treated the new resident, Mary.. However, I keep my thoughts to myself and sat through lunch with my mother and Joan. 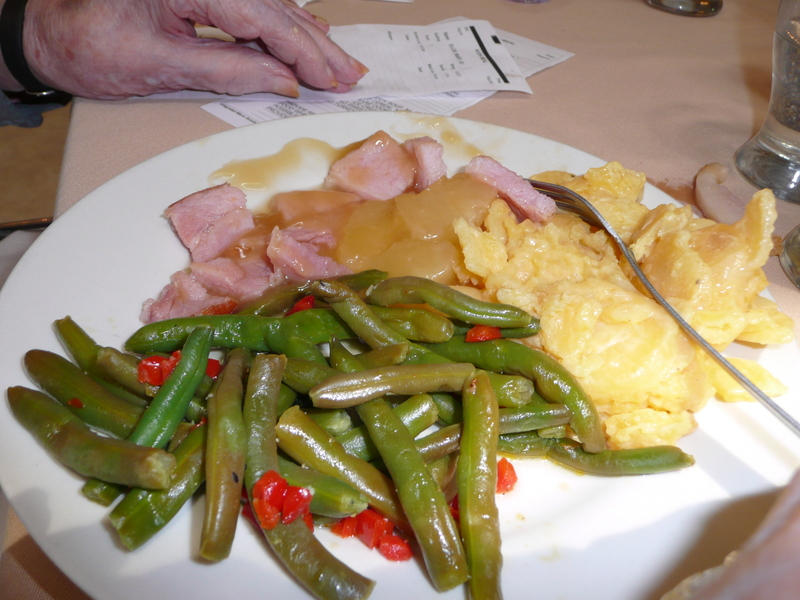 On the menu was ham, scalloped potatoes, green beans and a roll. Then she put her fork down and said “I’m not going to eat that, I will just wait for desert. 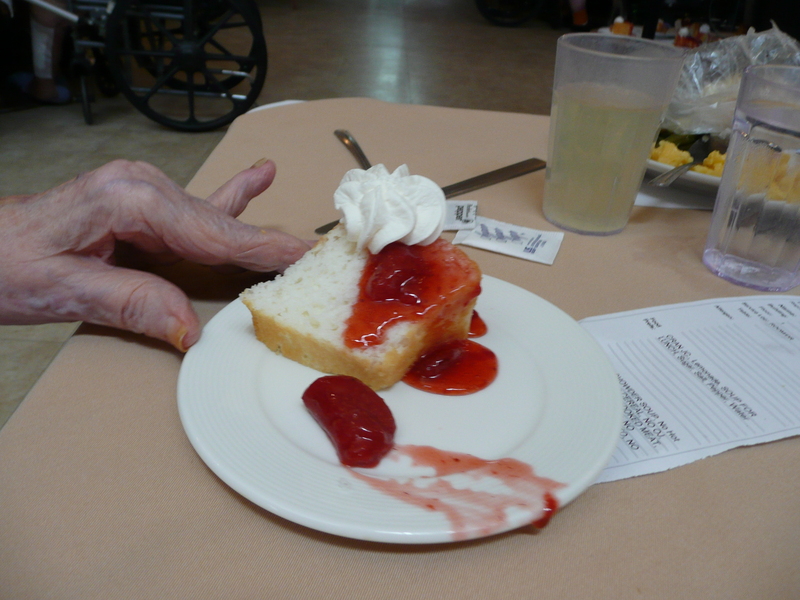 Lucky for her it was strawberry shortcake which is one of her favorites. 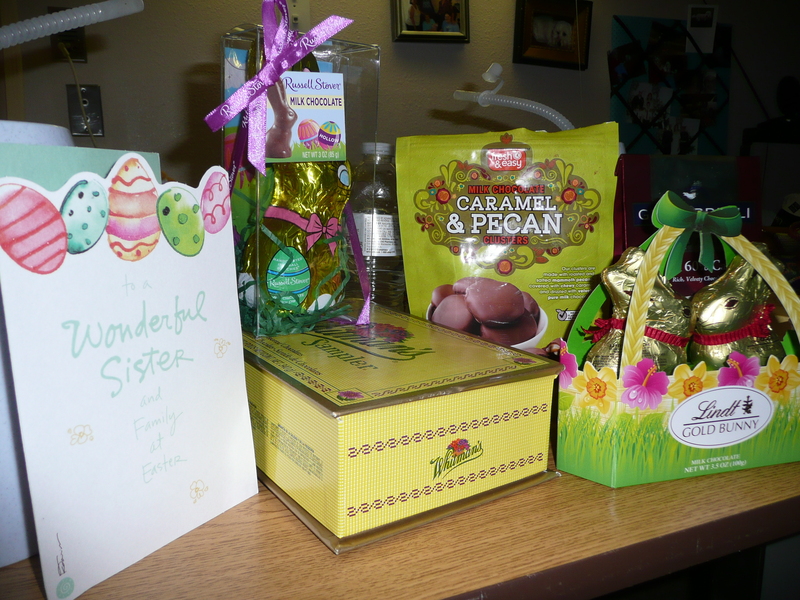 After lunch I pushed mom back to her room where she showed me her Easter stash. I decided a change of subject was in order so I asked mom if she would like to talk to her sister, my Aunt Ellen. She said she would so I called Aunt Ellen and mom had a nice chat with her until mom got distracted about something going on in the hall and handed me the phone back. I chatted with Aunt Ellen for a few minutes and she thanked me for making the call. This was one of those visits that reminds me that while I am frustrated with the behavior I witnessed from both my mother and Joan in their treatment of Mary, I must not judge them. I’m not in the position they are in now… and I hope I never have to be. All I know is I’m still thinking about and feeling bad for Mary…! Bill and I started our Easter Sunday by attending a 6:00 a.m. sunrise service at our church. Then we came home and had a light breakfast because we knew we were going to have lunch/dinner out. 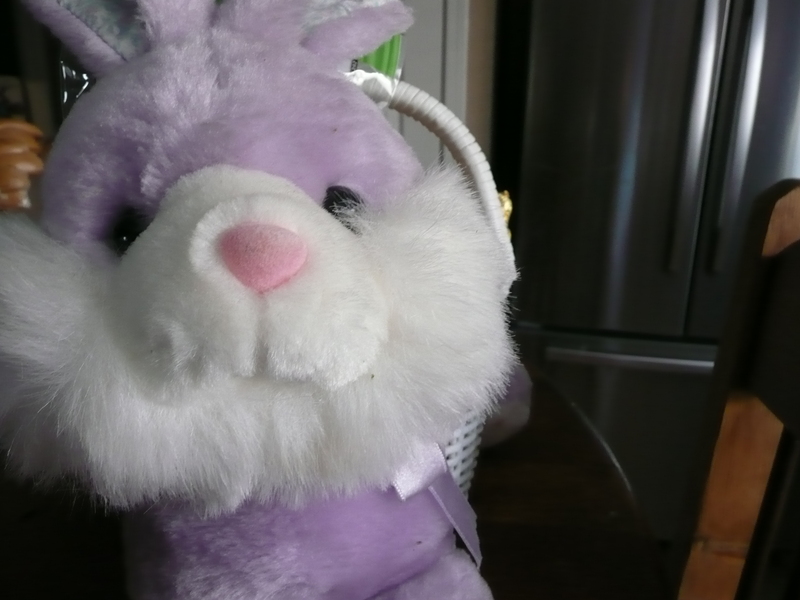 and bunny tail on the back, with the basket in between…And true to tradition, the Easter Bunny filled her basket again this year with all her Easter favorites. 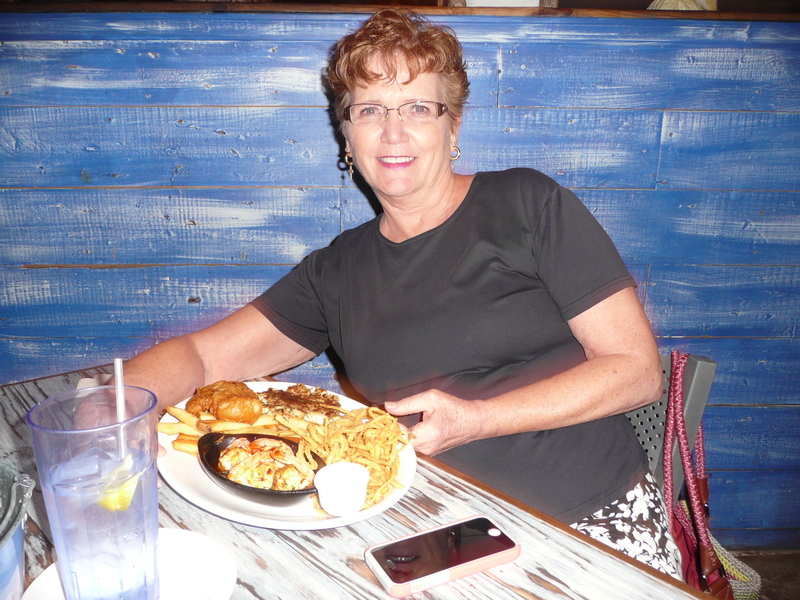 When it came time for our Easter lunch/dinner, we headed over to Joe’s Crab Shack. 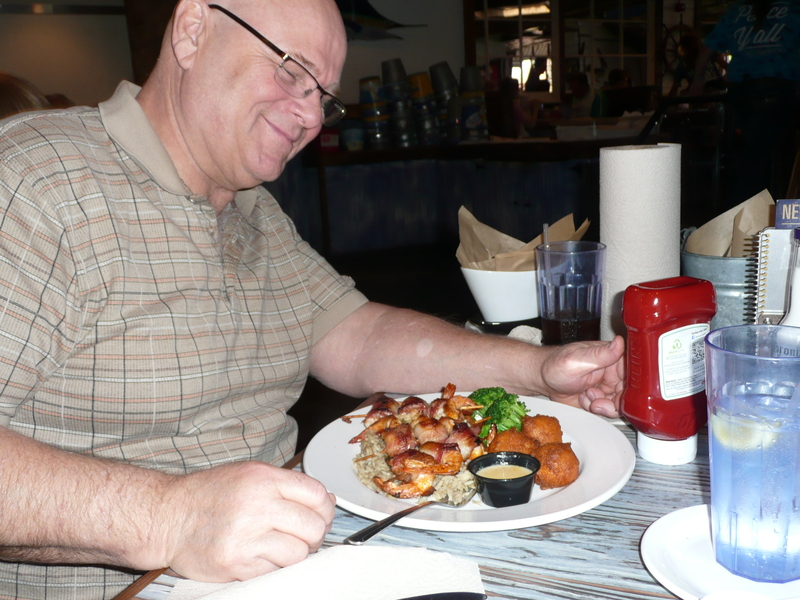 Bill had a Southern bacon wrapped stuffed shrimp plate, complete with one of my all time favorites…., hush puppies! I went for the East Coast sampler platter. 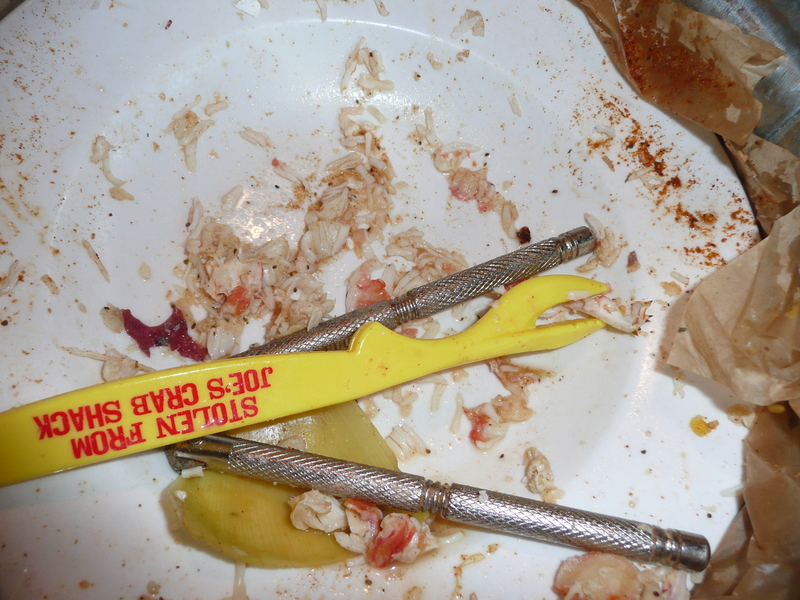 It had fish & chips, crab stuffed shrimp, and a delicious crab cake. 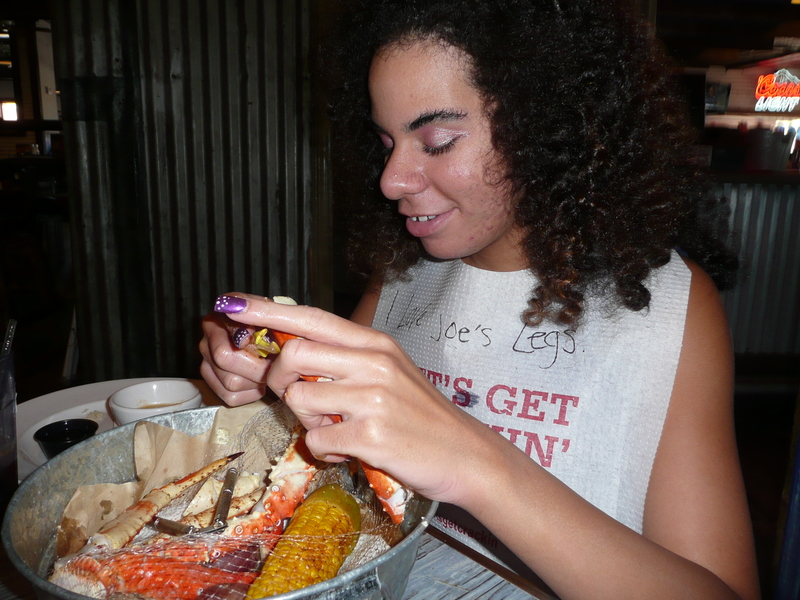 Shantel said nothing but King Crab Legs was going to hit the spot for her. 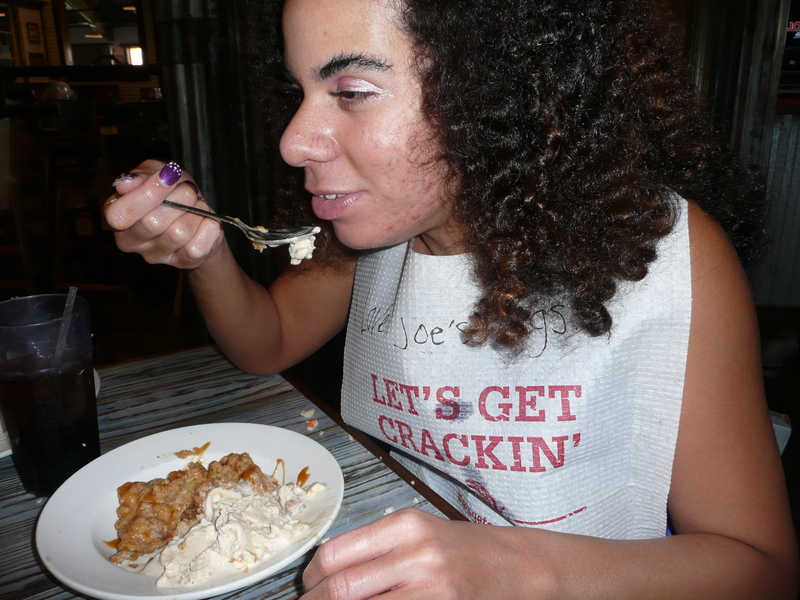 She went after those crab legs with a vengeance! I asked Shantel if she was enjoying her Easter meal. She said ” yes, I’m just so overwhelmed with food right now I don’t know where to start.” Trust me, she had no problem working her way through all that food. When the waitress came by to ask if anyone saved room for desert… both Bill and I said we couldn’t eat another bite… But not our girl… no, she asked what her choices were and decided on an apple cobbler type desert topped with cinnamon ice cream..
OMG… where does she put it all and stay so slim…? Hoping each and every one of you enjoyed a Happy Easter! Look what the Easter Bunny brought us! Our brand new La-Z-Boy power reclining sofa. Just push a button on either end and they recline. So, so, comfortable. I may never get Bill out of the house again… Ha! The color is called silt. The fabric is a micro fiber that is made to look like leather and this particular color looks like an old bomber jacket. 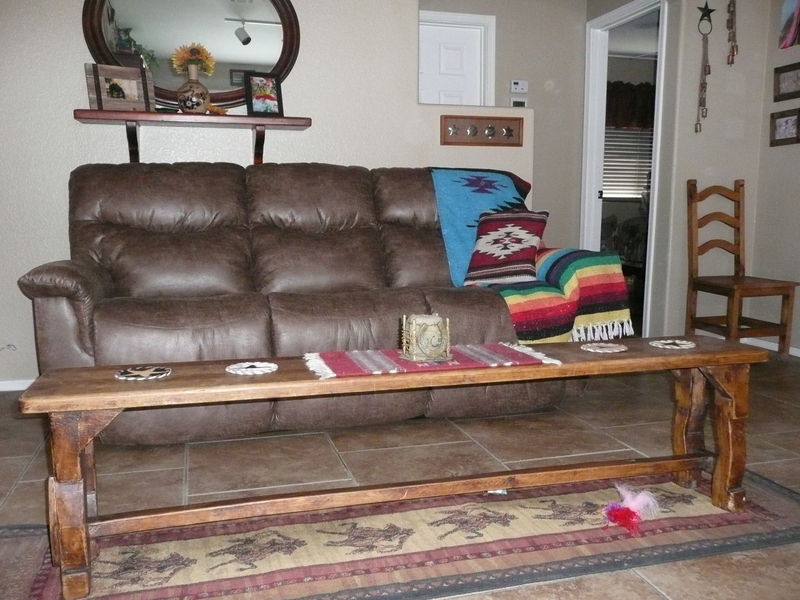 Very rustic, and fits into our decor perfectly! 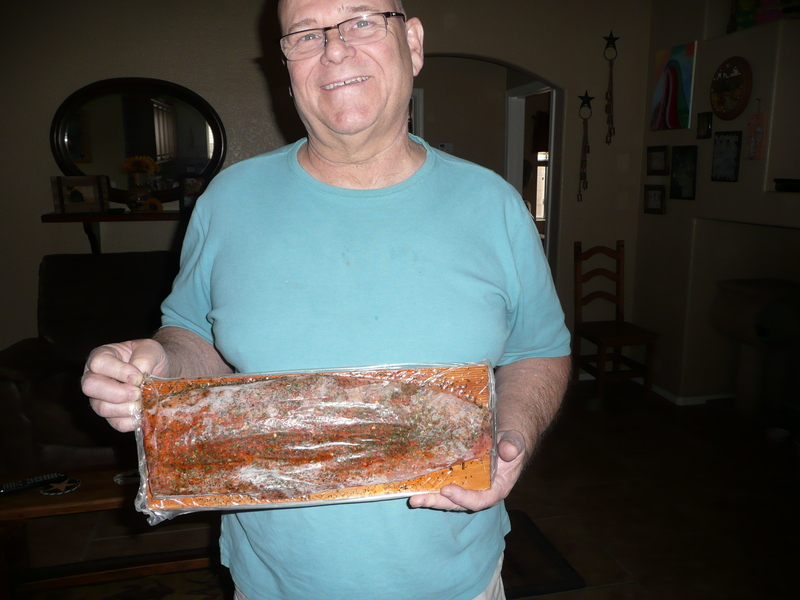 Every week we have a dish made from small amounts of left overs from other meals during the week. This past week we had B-B-Q chicken, tacos, a goulash pasta dish, and smoked pulled pork sandwiches. 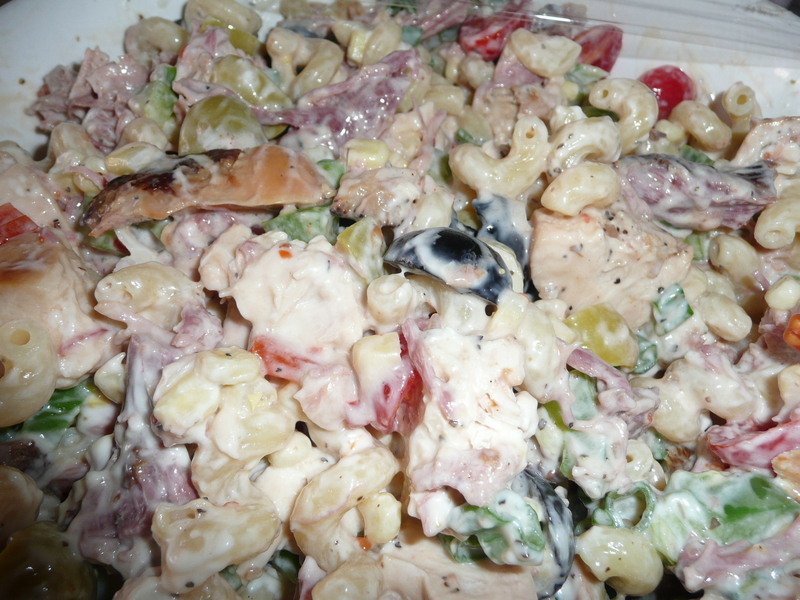 And like always, we had some leftovers… So today, I made what I call “mustgo pasta salad. I had a half of bag of pasta left over from the goulash dish so I cooked that. While the pasta was cooking, I chopped up a half of a green bell pepper, cherry tomatoes, and green olives that were left over from a salad earlier in the week. I also had some black olives, and green onions left over from taco night, so I chopped them up as well. I put everything into a large mixing bowl and added some left over smoked pulled pork and a left over B-B-Q chicken breast that I pulled off the bone and cubed. I added some frozen corn, and two Weight Watcher smoked string cheese sticks that I cubed. I mixed in some light Mayo and some fat-free Italian dressing (just enough to coat all the ingredients). 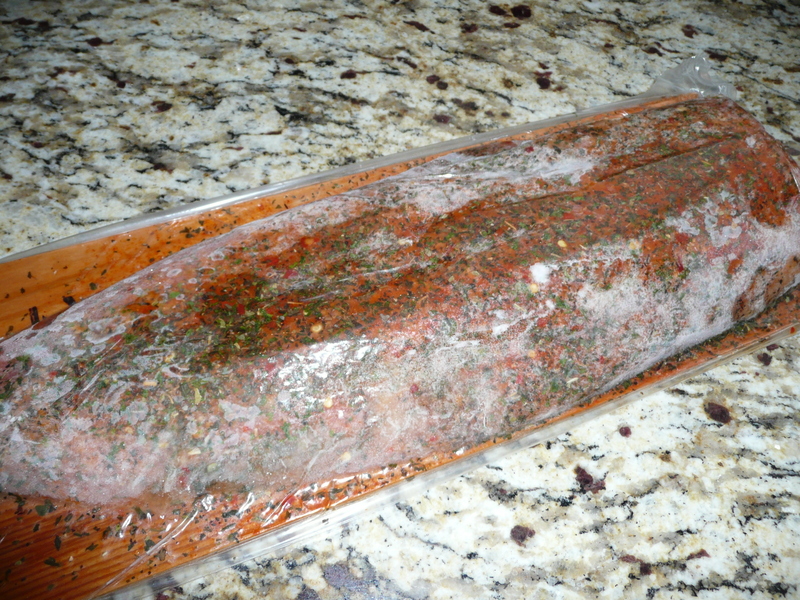 Seasoned with coarse black pepper to taste, covered with plastic wrap, and set it in the refrigerator to allow all the flavors to blend and the smoke from the pulled pork and smoked cheese to seep into the dish lending that smoke flavor to all the other ingredients.